The arrival of a tank of lobsters in the General Store in Klippiesfontein, South Africa, makes everyone uncomfortable. This isn't the kind of place that welcomes change. In a town troubled by undercurrents of racism and poverty, some people show their worst traits while others shine through with humour and affection in this touching story of friendship, marriage, kindness, redemption and brightly coloured shellfish. Although Colette Victor has been living in Belgium since 2001, in heart and marrow she's a South African. As a community worker in a disadvantaged ex-mining community in Genk, she works with an array of people from a range of ethnic and social backgrounds. When she's not working, writing or being a mum, she promotes reading for young children and teaches creative writing to people from disadvantaged backgrounds. A memorable story with engaging characters - I really enjoyed this book. Congratulations, Collete! Bianca from Romania! cannot wait to read more from this author! 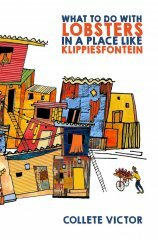 Takes you into South Africa itself! She is a brilliant writer! She has always displayed a great creative mind since the age of 7. She keeps one enthralled!